If you’re moving to MDaemon from another email platform, or if you want to consolidate your local address books into one centrally-located database for easy access from anywhere, then you’ll want to import your contacts using WorldClient. When contacts are imported into WorldClient, they are stored in a folder on the MDaemon server and accessible from your ActiveSync-connected mobile device (or Outlook 2013 & up connected via ActiveSync), Outlook via Outlook Connector, and WorldClient – MDaemon’s webmail client. This knowledge base article lists the CSV fields that can be used when importing contacts into WorldClient. In this brief tutorial video, I show you how to export your contacts from Outlook to a CSV file, and how to import that CSV file into WorldClient. If you have questions, send me an email at training@altn.com. 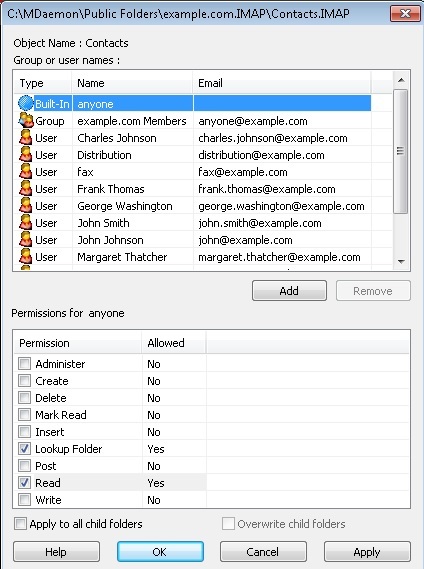 WorldClient (MDaemon’s webmail client) includes an auto-complete feature that allows entries in the To: and CC: fields to pre-populate with suggested names & addresses that match the characters you enter as you type. This works when sending mail to local or non-local domains. When hosting multiple domains in MDaemon, steps can be taken to allow this auto-complete feature to populate entries from other MDaemon-hosted domains. WorldClient’s auto-complete feature will display email addresses that are in any contact list accessible by the user. By default, for each account created MDaemon creates an entry in the public folder for the domain that account was created in. 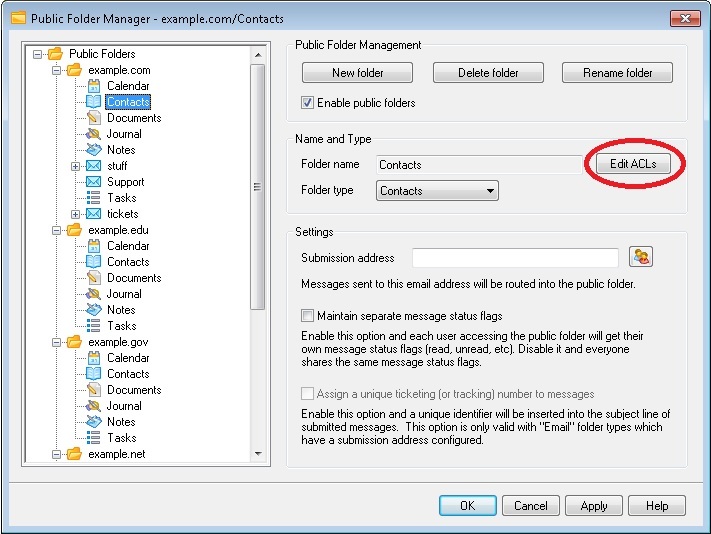 By default this public folder is located at C:/MDaemon/Public Folders/example.com.IMAP/Contacts.IMAP. Also, by default, the public folder of the domain a user is a member of is accessible by that user, so any accounts on the domain to which the user belongs will appear in his WorldClient auto-complete list. To make the contacts lists for all domains on your MDaemon server accessible by all users, in the access control list (“ACL”) for each public contacts folder on your domain, change the rights for “Built-In (anyone)” by highlighting it and clicking on the Edit button. Select at least the “lookup” and “read” checkboxes below. By doing this, you will grant all users on all domains on your MDaemon server permission to view the public contacts for all domains on your MDaemon server. This means that the MDaemon auto-complete feature should display all of the users on all domains on your MDaemon server. Thus, because the user has access to this whitelist folder by default, the entries contained within the folder will also be used for WorldClient’s auto-complete feature. If you have questions, let us know via the Comments section below! User Accidentally Erased All Contacts? Has this happened to you? You're the MDaemon administrator, and one of your users has contacted you in a panic because he accidentally deleted all of his contacts from his ActiveSync connected device. The device then re-synced with the server, at which point all contacts were deleted from the server. This is a good case in support of backup & archiving. You just never know when you'll need a backup copy of your data, and most businesses these days can't afford to NOT have a backup solution in place. To restore the user's contacts, you would simply need to restore the backup copy of the user's addrbook.mrk file, which you can find in the Contacts.IMAP folder of the user's mailbox (example - C:\MDaemon\Users\example.com\frank.thomas\contacts.IMAP). You may also see a series of .MSG files in the same directory within your backup. These .MSG files are created from the contents of the addrbook.mrk file by Outlook Connector. You will not need to restore these .MSG files since they will be recreated automatically. This same concept also applies to your calendar entries (Calendar.mrk&#41, tasks (TaskList.mrk&#41 and notes (Notes.mrk&#41.